31: Last day of 2006! 'tis been a good soaking year. May next year be even better! Soak on ALWAYS! 17: Somehow, November was missed. It wasn't as if nothing has been happening, only that all the activity has either been on the iSoaker.com Forums or offline. 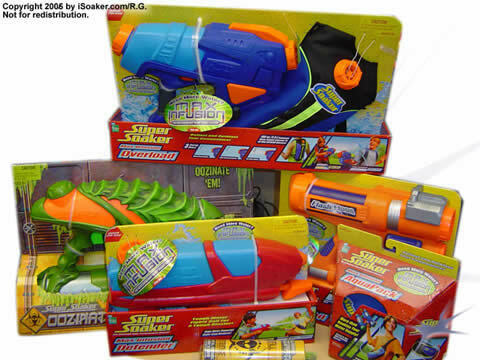 The big current news is that the 2007 Super Soaker line has been leaked out by Entertainment Earth. Special thanks to "scorpion" on the Forums for posting up the link to the page. This large nozzle gun has two settings (for regular streams or massive streams) to soak your friends! With a capacity of 100 oz., this amazing weapon has a wide shoulder strap, is Max Infusion compatible, and can shoot up to 40 feet. You'll be a feared Super Soaker warrior with this amazing water weapon! Soak your enemies! When you're caught, cornered, or in a bind, this awesome blaster gives you the edge to never surrender! The blaster's rotating nozzle has three different modes: wide-stream, fan-blast and high-powered! There's also a hidden nozzle! Surprise your opponents with a secret stream, where they least expect it! A huge 40 1/2-ounce capacity keeps you blasting longer than smaller-capacity blasters! High-powered streams can reach targets up to 35 feet away! Ages 6 and up. Need a little more ammo? The 100 oz. Aqua Shock Back Pack lets you add extra water to your weapons without having to stop off at a faucet or a hose. This comfortable pack is compatible with any Max Infusion system Super Soaker. Comes with handy quick-fill cap so you can fill it again in a hurry. Blast your buddies! This awesome air-powered water blaster takes water-blasting to a new dimension: over the top, around the corner, and side-to-side! Its stealth design delivers shock and surprise, while maintaining high performance and rapid-fire blasting. A huge 47-ounce capacity keeps you blasting longer! High-powered streams can reach targets up to 20 feet away! Tough water fights call for a tough water blaster! The Super Soaker Max Infusion Defender will bring your competitors to their knees. Armed with high-powered, pressurized technology for powerful blasting and an advanced hydrodynamic design for huge water capacity, the Max Infusion Defender blaster will unleash a total water explosion! Getting soaked has a whole new twist! The Max Infusion Helix blaster is perfect for all-out water fights! Adjust the nozzles for wide or narrow streams while blasting out two powerful spinning streams of water at your opponents! It'll be nearly impossible for your opponent to outrun you! 12: Water Warriors: Chameleon review posted. 1: iSoaker.com Rogue Group reborn. Fear NO soaker! 30: Submitted reviews on the Shield Blaster 5000: Cruncher and the A.R.M. 4000 XL posted. 15: Submitted reviews on the Blazer (2005), Triple Shot and Super Shooter Pump Cannon Shotgun posted. 12: Submitted reviews on the Max-I: Defender and Flash Flood posted. 8: Battle of the Sexes story posted. Submitted review on the Piranha posted. 7: Being interviewed live on Toyko FM on a radio talk show called 'Eyes on Tokyo'. Will be broadcast at 5:15am Toyko Time. Fun, short ~15 minute interview. Granted, they changed the questions I thought they were going to ask, but was fun nevertheless. I still wonder how many people listen to that show in the morning. 2: mySoaker Gallery updated. wetmonkey's armoury picture posted. Wildboys' armoury images updated and pictures of Lakeside Village battle grounds posted. 20: Nozzle and some internal pics of a CPS2500 by Mike9909 posted. 14: Pictures of many nozzle-drilled soakers (SC500, CPS2500, CPS2700, Monster X) by Dragon-class. Triple Shot Internals pictures by Mike9909 posted. 5: Water Warriors: Cross Fire review posted. 16: Great pictures submitted by General Matt: General Matt's Armoury | Armoured Assault Vehicle. 8: iSoaker.com turns 6 years old today! 1: Submitted article by Peter_MJ entitled High-power retail water guns posted. 27: Great submitted article by Peter_MJ entitled "Building vs buying" posted. 21: New pictures of Wildboys' Armoury posted. 10: Review of the Water Warriors Scorpion posted. 29: Submitted review of the Water Warriors Lightning posted. Article posted: Themes and the Evolution of Water Guns. 26: Numerous submitted pictures have been posted: CPS1500, SC600, WW Blazer (2005), 2005 WW Piranha (2005). Also check out WildBoys' Painted CPS3000. Submitted review on the X-Stream Super Cobra posted. 7: Submitted review on the 2005/2006 Blazer posted. 1: New story posted: Battle Report: 3/31/06, The Ridgewood Militia opens the season! 30: Glossary updated with more standardized soaker terminology for sizes, power, and shot times. 25: New Wallpapers posted. New Gallery pictures posted in the newly formatted Gallery section. 24: Sitewide update! Two new sections launched: mySoaker and the Training Grounds. mySoaker section showcases various water warriors and water warfare teams throughout the globe. In addition, it serves as the repository for general water warfare fan submissions (except for soaker reviews and training guide info). The Training Grounds is the rebirth of the previous 'Tips & Tactics' subsection. After some debate, it was decided that having a dedicated section for water warfare games and training will make finding such info simpler for those newer to water fights. 19:Water Warriors: Splat Blaster review posted! 9: Max Infusion: Overload review posted! 31: Max Infusion: Defender review posted! 28: New fan story posted: The Labyrinth Incident. 26: Just received sample products of the 2006 line of Super Soakers. Included in the line are the Max Infusion Overload and Defender (as well as Max Infusion rebuilt Helix, Flash Flood, and Arctic Shock). There is also a Max Infusion Aquapack (a backpack that is sold separately) as well as the Super Soaker Oozinator that can shoot both water as well as 'Bio-Ooze' (not 100% sure what 'Bio-Ooze' is made of). See the Forums for discussion threads. 25: iSoaker.com Forums re-organized. Forum-types reduced down to 3 main forums plus one for archived article-type posts. 4: Site updated for 2006! The largest change lies in the Armoury wherein almost every review has had its images updated with newer, higher-res. pictures (this change is also reflected in the organization of the Product Gallery). Aqua-Master system will be improved to make pumping a little easier. Argon will still use 3 pumps, Xenon will go to 4 pumps and Krypton to 5 pumps. This will reduce the force by approximately half. Splat Blaster is new for 06. Designed like a shotgun, one pump bladder system, large nozzle. Range is limited to about 25 ft. but it is a close-in defensive weapon. Shoots a big Blast of water with shot-gun like performance. This item was developed right here at i-soaker, if you go back through the suggestions, you can see it. Thanks to all of you who contributed, I hope it is what you were asking for. Of course, previous models are still available in different color combinations for 06. Hopefully more information will be available in the near future. For now, enjoy the changes. More are still planned. ...and, as always, Soak on!